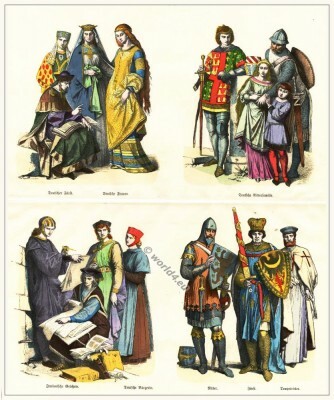 Medieval English fashion. 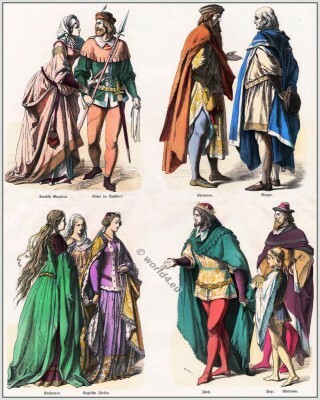 14th century costumes. Gothic era. 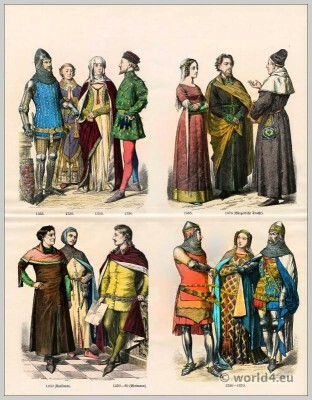 Medieval English fashion. 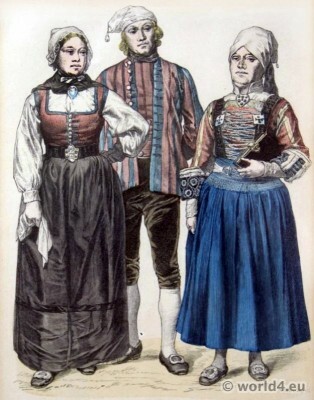 14th century costumes. This entry was posted in 1330, 1350, 14th Century, Court dress, Ecclesiastical, England, Middle Ages, Military, Nobility and tagged Gothic costumes, Knighthood, Medieval costume, Münchener Bilderbogen on 1/28/14 by world4. 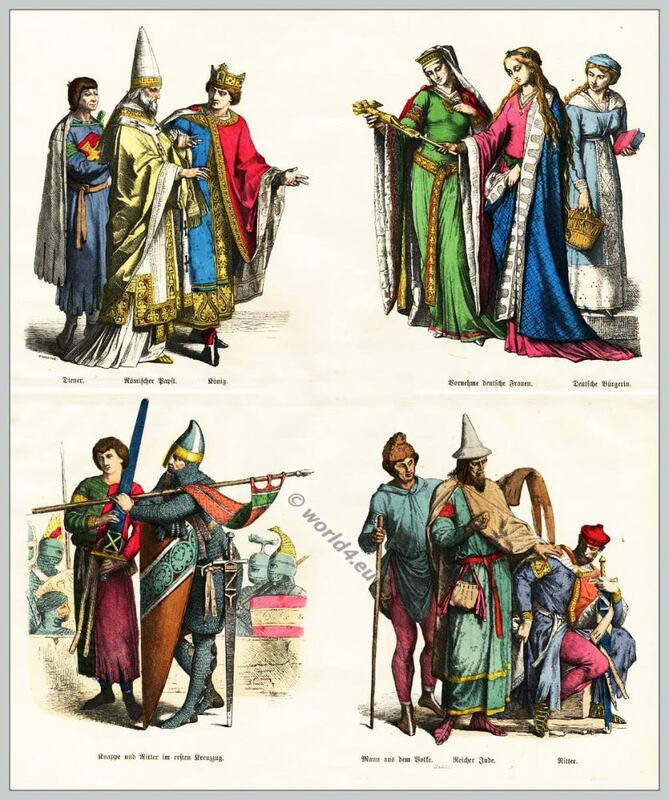 German Medieval dresses in the 14th Century. German Medieval dresses 14th Century. This entry was posted in 1350, 1360, 1380, 1390, 14th Century, Burgundian dress, Court dress, Germany, Middle Ages, Military, Nobility and tagged Burgundian fashion period, Knighthood, Medieval costume, Münchener Bilderbogen on 1/27/14 by world4. 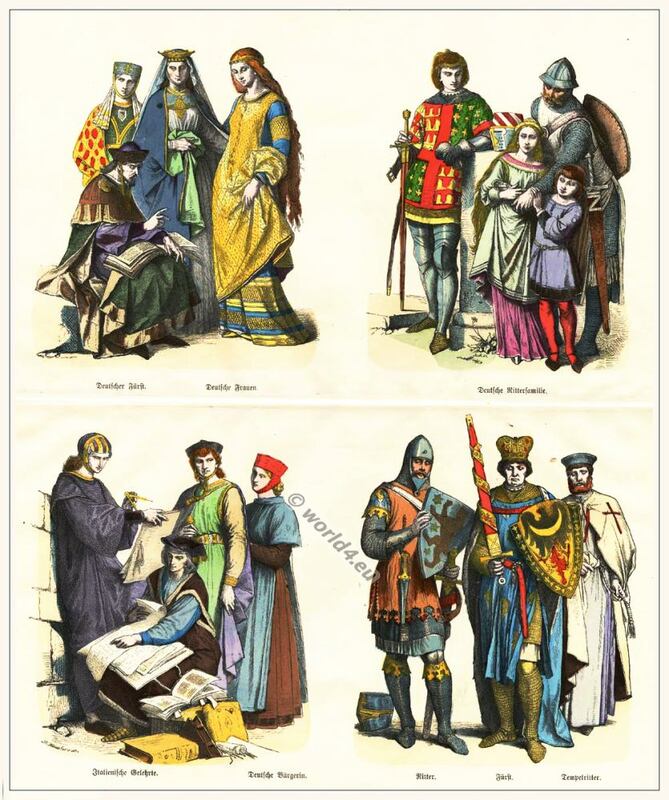 English and German medieval clothing in the 14th Century. 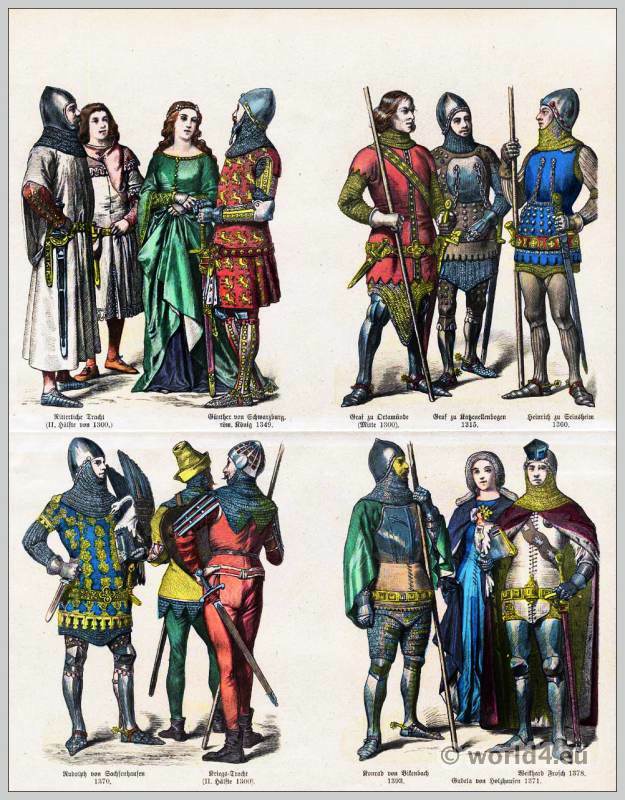 Top row left: Clothing of a German Castle woman and a knight in hunting dress. Right: Clothes German nobleman and citizens. Bottom row left: Courtyard clothing English noblewomen and an English princess. Right: Court clothing English prince, Page and nobleman. This entry was posted in 14th Century, Burgundian dress, Court dress, England, Germany, Middle Ages, Nobility and tagged Burgundian fashion period, Medieval costume, Münchener Bilderbogen on 1/27/14 by world4. 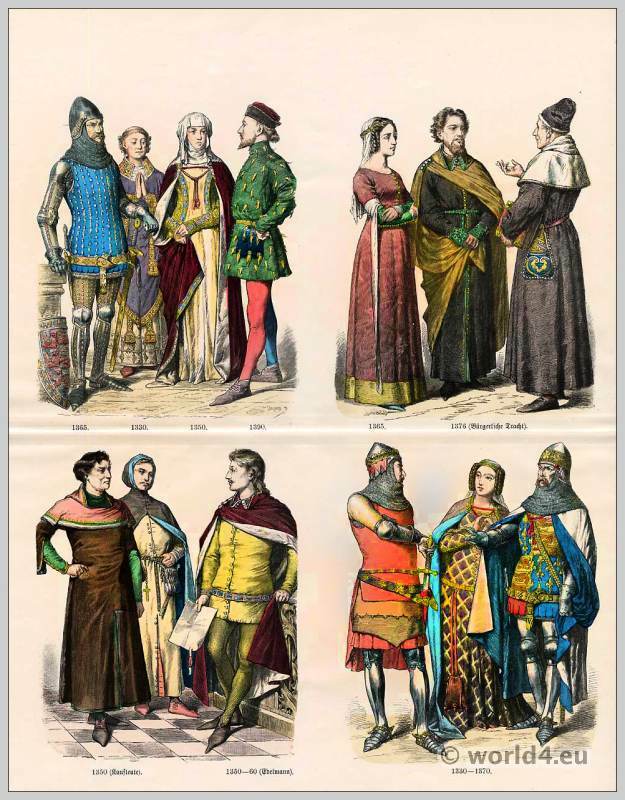 Clothing in the 13th Century. 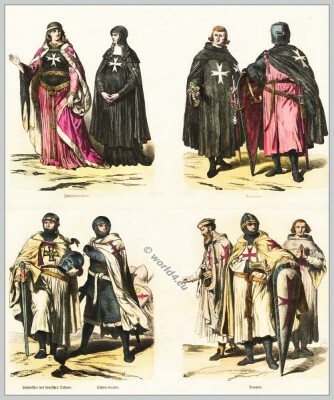 This entry was posted in 13th Century, Child, Court dress, Germany, Italy, Middle Ages, Military, Nobility and tagged Crusaders, Gothic costumes, Knighthood, Medieval costume, Münchener Bilderbogen on 1/27/14 by world4. 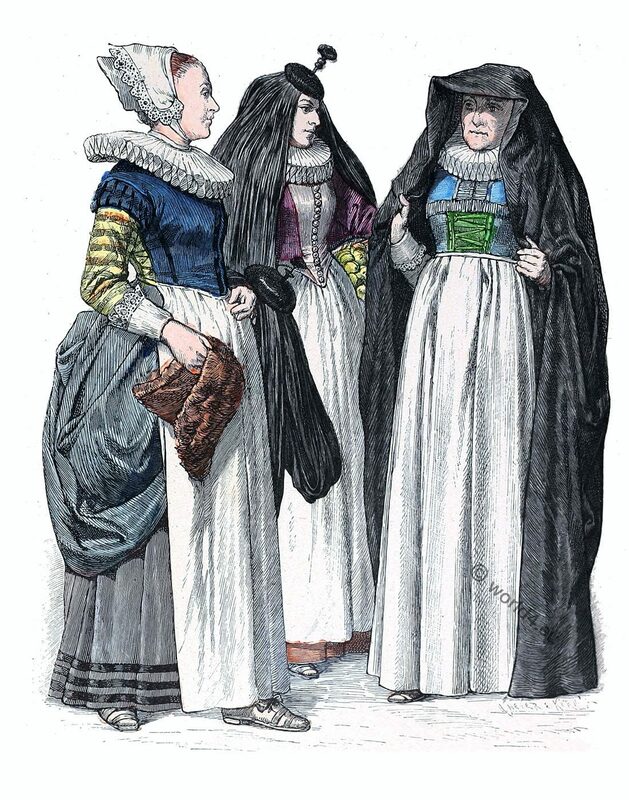 12th century clothing. Roman pope and king. Medieval chivalary. Gothic fashion era. This entry was posted in 12th Century, Court dress, Ecclesiastical, Germany, Middle Ages, Military, Nobility and tagged Crusaders, Gothic costumes, Jewish Clothing, Knighthood, Monastic clothing, Münchener Bilderbogen on 1/27/14 by world4. 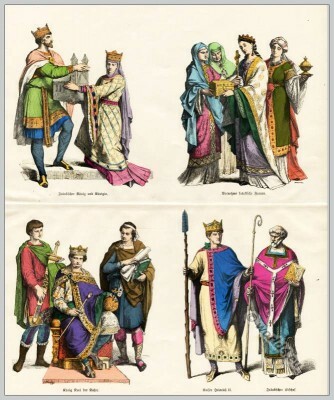 Top row left: Frankish king and queen. Right: Frankish noble ladies. 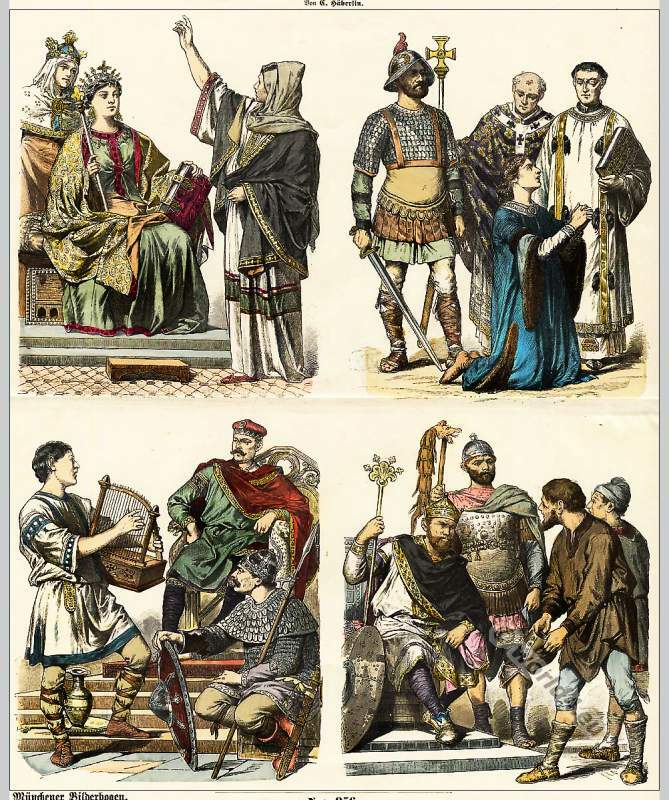 Bottom row left to right: King Charles the Bald with Empire insignia. Page and court scribe. Right: Emperor Henry II and Frankish bishop. 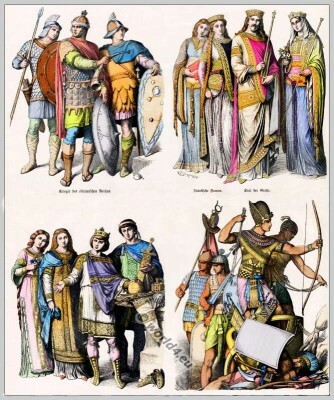 Costumes of the Carolingian Period from 752-987. Reign of Charlemagne. 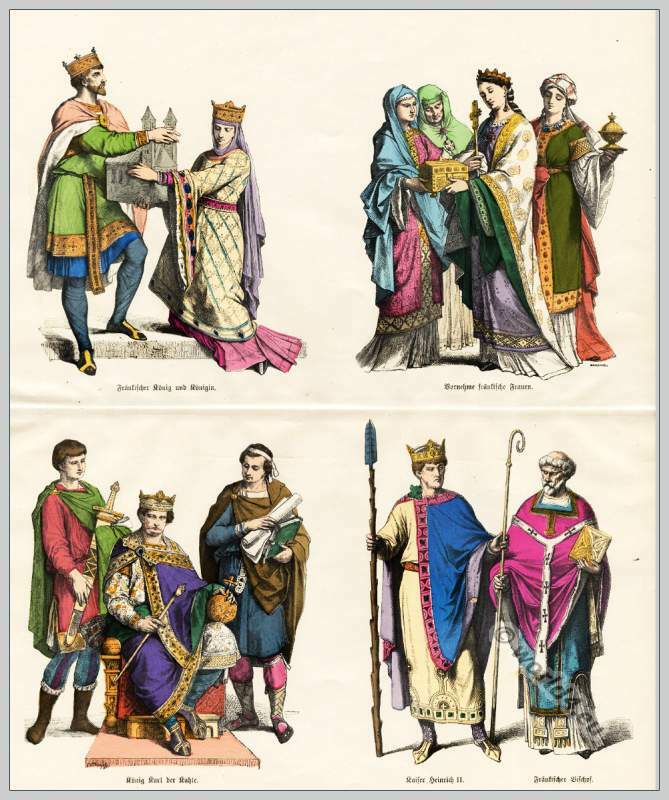 The Carolingian Fashion Period from 987 to 1270. by Augustin Challamel. This entry was posted in 10th Century, Carolingian, Ecclesiastical, Middle Ages, Nobility and tagged Crown, Medieval costume, Münchener Bilderbogen on 1/26/14 by world4. This entry was posted in 10th Century, 5th Century, Carolingian, Court dress, Egypt, Middle Ages, Middle East, Military, Nobility and tagged Medieval costume, Münchener Bilderbogen on 1/26/14 by world4. 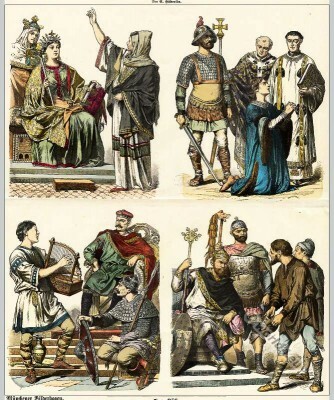 Carolingians in the 7th and 8th Century. 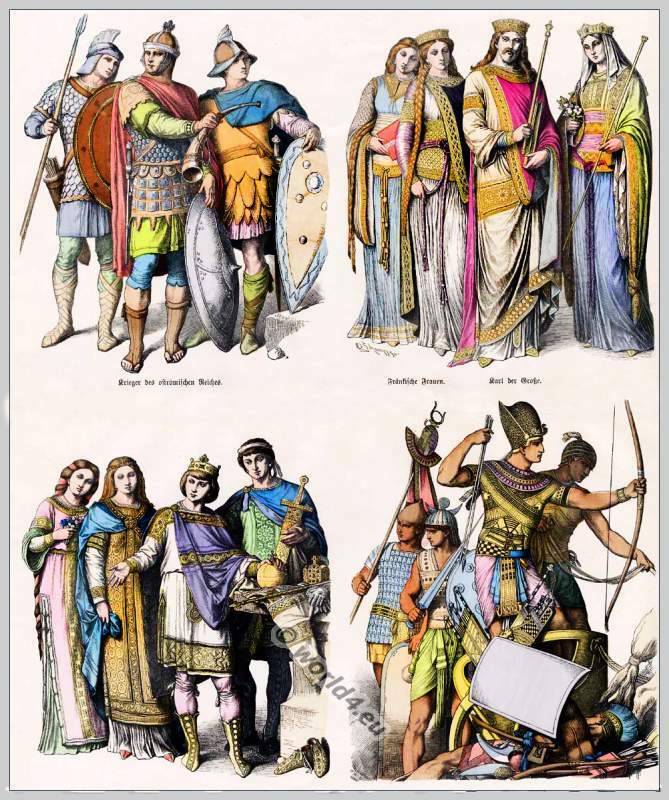 Medieval Clothes of the Carolingians in the 7th and 8 Century. This entry was posted in 8th Century, Carolingian, Ecclesiastical, Middle Ages, Military, Nobility and tagged Medieval costume, Münchener Bilderbogen on 1/26/14 by world4.